MY KOOLATRON PORTABLE REFRIGERATOR IS A HONEY! I suppose you could call this a “sidebar”. That’s newspaper jargon for an interesting little tidbit of information. Like a Timex watch: It takes a licking and keeps on ticking!" I don’t want to start pitching products on this blog but I think it is worthwhile for people who read my blog and know how dedicated to RemarkableJourneys I am: especially the ones who picnic or camp or attend sports events need to know about a really great product that has made my Journey Remarkable. Sometime back in the late eighties or early nineties, I don’t recall exactly when but we were camping a lot, we purchased a Koolatron Portable Refrigerator. Made in Canada. I also don’t recall where we bought it (maybe Camping World, I think). This little gem has been my part-time travel refrigerator for close to 25 years of travel across North America. Now that I am a full-time traveler it has been all I need to keep items that need to be cool: fresh and edible for days. It keeps warm items warm as well—just with a turn of the cord. For years, when we weren’t traveling the Koolatron went right back into the box it came in and was stored away in the garage until the next trip or group event. Everything stay really fresh and crisp. As Desi would say: “Lemme ‘splain”. 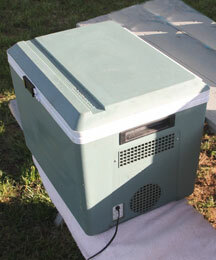 This is not a cooler—it is a camping refrigerator and food warmer. This handy dandy portable “fridgeeator” that plugs into any car 12v power outlet, with it’s very long cord it can even be kept in your car trunk: the cord can come inside the car through the split rear seat opening many cars have these days. When its time to stop at any place with 110v household current it simply plugs into an outlet in a motel room or whatever source and runs on 110v. It comes with a handy converter. The only time in all these years that it failed me, it wasn’t the fault of the Koolatron it was operator error. One night away out in the redwood forest, I left it plugged into the car battery overnight while I slept in my tent. That is what you call user dumb-stuff. So if you are in the market look these guys up. Just remember I’ve had this little beauty for a long, long time. And since the first January this year I have used it constantly as the only refrigerator in my little 1958 trailer. I washed the Koolatron out today, cleaned it up a little bit and it still looks brand new. Just love it. Thanks Koolatron! A very cool device for sure. I have one and have often thought about getting the little low voltage cutout module to avoid the dead battery problem. Also I came across some info on draining lead acid batteries. Apparently 50% max is recommended as it shortens the usable life of the battery. That point is somewhere around 11V. Happy trekking! Love the name. Sounds like something George Jetson would use! :>) Good to know some things stand the test of time.